Dr. Dan Hughes obtained his Bachelor of Science degree in Biology from Denison University in Granville, Ohio and his Doctorate in Veterinary Medicine from The Ohio State University in Columbus Ohio (2011). He began practicing small animal emergency medicine immediately upon graduation. He also volunteered briefly at the Ohio Wildlife Center. His emergency veterinary experience includes complex medical case management, surgery, ultrasound and flexible endoscopy. Dr. Hughes chose to pursue veterinary medicine late in his college career, during a semester abroad in Australia. There he took a wildlife rehabilitation course and fell in love with the aspects of medical treatment. "My fascination for medicine carried over into the other species I went on to work with, and my passion for veterinary medicine grew from there". Dr. Hughes joined AEC in 2014. He is a member of the MVMA, SEMVMA, IVECCS, AVMA, OVMA and Ohio State Alumni Society, and is licensed in both Michigan and Ohio. 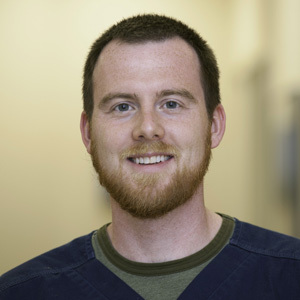 "The part I like most about my job is truly making a difference in a patient's life. I also enjoy the diagnostic and treatment challenges of critical patients. I offer our clients strong communication: my goal is to understand owners and their expectations, and to help them understand why their pet is sick, and the reasoning behind any tests or treatments. In this way, we can make the best decisions for the care of their pet." Dr. Hughes professional goals are to constantly grow and evolve in order to offer patients the best care available. His personal interests include running (8 marathons so far), reading science fiction, and managing 3 cats and 3 chickens!